I’ve been reading a Bible devotional on my You Version Bible app. It’s called “Launch out into the deep!” By Lisa Singh. It gave me some needed encouragement, and I wanted to share it with you. Hopefully, it will give you some encouragement. We all know that God wants us to live an abundant life. An abundant life comes from talking with God (prayer), seeking Him (reading the Bible), and following His commands (obeying His Word). I don’t know about you, but even when I think I’m doing all of those things, I can still become discouraged. In Luke chapter five, Jesus was standing by the Lake of Gennesarat talking to the crowds of people surrounding Him. Jesus saw Simon Peter’s fishing boat and decided to get in it, thinking it might be easier to teach the people from the boat. Jesus asked Simon Peter and his crew to take the boat out a little from the shore. So Simon Peter got in the boat and took Jesus out from the shore. This story reminds me of the saying in the above photo. I can’t tell you how many times I’ve become discouraged when I’m trying to live a life for God, or when I’m trying to be that good mom, or when I’m trying to be the loving wife, or when I’m trying to compassionately care for my patients, or when I’m trying to write a good story that tells of God’s love. 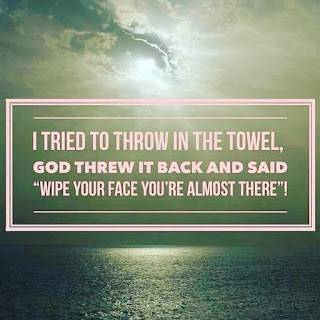 So many times, I’ve wanted to throw in the towel. Life can be exhausting. Discouragement affects all of us. The thing is, just when we are on the edge of quitting and want to give up, God speaks to us. He tells us, “No, don’t give up. I am with you, and good things will happen. Trust My timing.” Friend, don’t give up. God hears you and sees you. He understands your feelings of discouragement, your lack of confidence, and your feelings of inadequacy. He says, “Don’t give up. Keep trusting Me. I am helping you. You’re almost there.” Cast your nets out one more time.